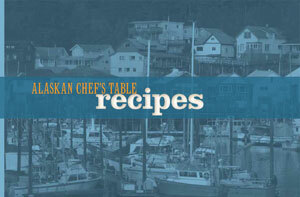 Recipes from the Alaska Fish House, Ketchikan's freshest seafood restaurant. We've chosen this recipe for the ambitious cook as a complete, one-pot meal. Comparable to "throwing in a roast", this hearty dish will keep the family around the table. For the stingy cook that doesn't want to give up any flavor to boiling or steaming. Roasting will maintain flavor, as well as provide very firm meat by comparison. 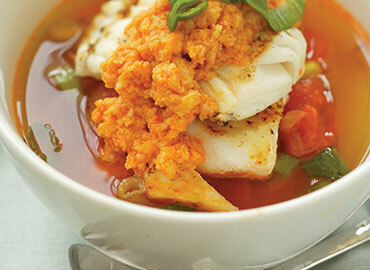 This condiment is unique to bouillabaisse, but is worth mastering as a condiment for whenever you strike out on your own culinary exploration. My go-to meal when I'm cooking for the kids is baked salmon. 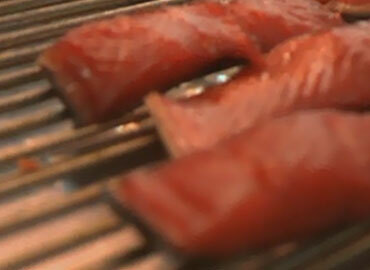 This recipe will show you how to bake salmon with whatever flavors your own family most enjoys. Unlike their southern counterparts, Alaska spot prawns live on a rocky bottom. This means they don't have to be veined before serving, which allows for a roasted-in-the-shell preparation. It rains here, a lot. As in, 10 feet a year. This is the chowder that keeps us warm and cozy. Mixing a pack of smoked salmon with cream cheese is a quick, easy, and delicious spread for a family get-together or football game. Here's a fancier version meant to impress. 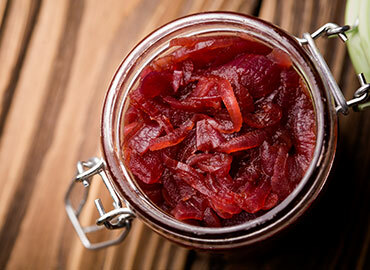 The perfect finishing touch for your gravlax appetizers, you'll also find this to be a delicious garnish for many salmon dishes. Preheat oven to 350° degrees. Slice the fennel, onions, and asparagus. Combine the vegetables in a bowl. Add the olive oil, white wine, salt and pepper and toss to coat. 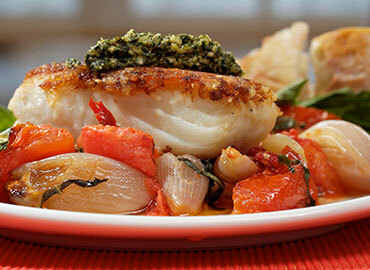 Pour the vegetable mixture into an oven proof baking dish deep enough to stack the veggies and fish. Cover with foil and bake for 15min. Once the potatoes have softened enough, remove dish from oven and add halibut fillets on top of the veggies. Re-cover with foil and bake for 8-12min or desired doneness. Fill a roasting pan with 1/4" water and wine. Add rosemary sprigs and lemon slices to the water. Arrange crab pieces on the roasting rack so it sits just out of the water with most of the rosemary and lemon directly underneath. Drizzle olive oil over crab, then sprinkle pepper flakes on crab legs. 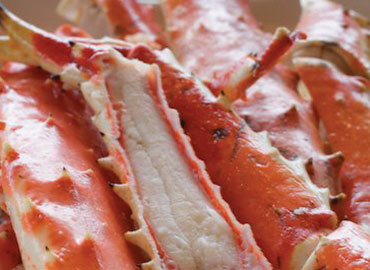 Roast the crab until the pre-cooked crab is heated through, 7 to 10 minutes. Take care NOT to overcook as you are only reheating the previously cooked crab. 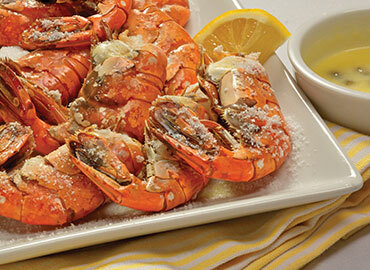 Transfer the crab pieces to a serving platter, surround them with the rosemary sprigs and lemon slices, and serve. Mash garlic to a paste with 1 tbsp lemon juice and a pinch of sea salt. Puree bell peppers, garlic paste, salt and pepper, and small amount of Harrissa, and 2/3 cup bread crumbs in a food processor. Transfer to a bowl. Drizzle in ¾ cup olive oil to mixture and hand mix until fully incorporated. Adjust bread crumbs and oil to desired consistency. Add remaining Harissa to taste. Make up to 3 days ahead, keep chilled and covered. Bring to room temperature before using, add oil as needed. To keep a fairly uniform thickness, leave the skin on the fillets and cut into two pieces. 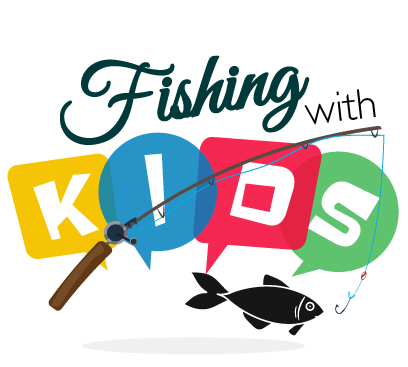 Quick brine the fish by sprinkling with a light coating of salt over the entire fillet. Rinse thoroughly after 10 minutes and pat dry. Slightly oil the dull side of a piece of aluminum foil, large enough to cover the fish. Place the salmon on foil skin side down. Squeeze 2-3 tsp of citrus juice on fillet. Mix coriander, mace, ginger together and sprinkle evenly across all fish, then lightly season with salt and pepper. Arrange lemon slices and onions on fillet, sprinkle with raisins and currents, then dot with butter. Pull up long side of foil and fold over leaving a space for the fish to steam, seal the edges tightly. Place on the grill, over the fire, or in the oven on a baking sheet. Bake for approximately 7-12 minutes until just rare in the center. 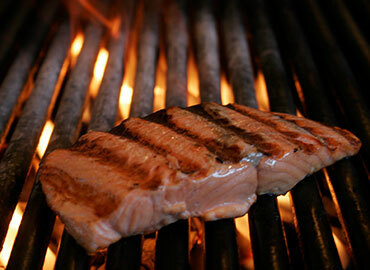 Shimmy fillet from skin with a wide flexible spatula and place on serving platter. Drizzle with cooking juices, a splash of citrus and small amount of cilantro prior to serving. Thaw, rinse and drain shrimp. Use a cast iron skillet or other heavy pan. Lay a ½” thick bed of course salt in the pan. Place the pan in oven until hot (approx. 3 minutes). Remove from oven and lightly press shrimp in salt. Return to oven and roast 4-8 minutes depending on size of shrimp. If using colossal shrimp, turn halfway through cooking. NOTE: Choose a heavy saucepan 6 to 8 inches in diameter. First measure 2 tbsps. of wine into the pan and tilt it; try to remember what that amount looks like in that pan. Add remaining wine and reduce by 1/2. The reduced wine should be deep yellow, not amber. Don’t hesitate to start over, if it tastes acrid vs. pungent. Then add the shallots, onions, preserved lemon and fish/chicken stock until warmed thoroughly. As soon as the wine mixture is warmed, pull the pan from the heat and immediately add a few drops of water and a few slices of the cold butter. Swirl, reduce the heat slightly, and return the pan to the burner. Whisk, continuing to swirl the pan on the burner, until the first pats of butter are nearly melted. Add another few and continue whisking to encourage emulsion. The emerging sauce will gain body as you add more butter. Don’t allow it to boil; if it starts to, quickly pull the pan from the burner, add a drop, or a few drops, of water at the edge, and swirl the pan to restabilize the emulsion. The sauce will taste under-seasoned at first, but it will get saltier as the condiments infuse it. 4 cups Yukon Gold Potatoes, cut to 1/4"
Saute potatoes, onions, and garlic with butter or olive oil until potatoes are tender, but not completely cooked. 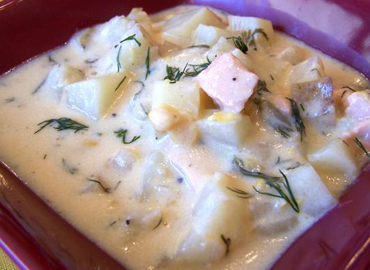 Add remaining ingredients and simmer until potatoes are cooked thoroughly and chowder has thickened to the desired consistency. Place cream cheese in warm place to soften. Remove pin bones and peel the skin off the smoked salmon. Break the salmon into small pieces. Mix all ingredients thoroughly and chill for several hours or overnight. Combine all the ingredients. Simmer over low heat until reduced by half. Allow to cool completely and store in refrigerator for up to a week.